California has In-N-Out and the rest of the country has Five Guys, but Austin has a local burger stand that is quite arguably better than both. As an Austinite, I am drawn to the hip, Jetsons-esque vibe and the great prices, but as a vegetarian, I am personally invested in sharing the greatness that is the P Terry&apos;s veggie burger with the world (and don&apos;t even get me started on those amazing fries). 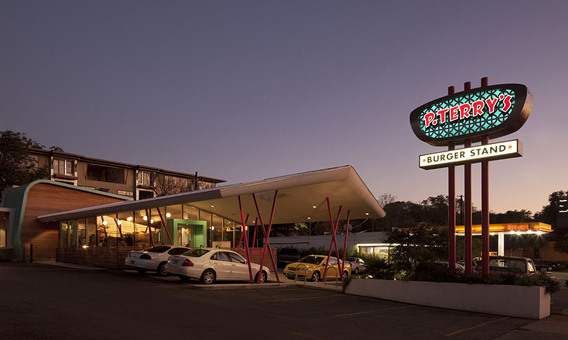 P Terry&apos;s Burger Stand, N. Lamar Blvd. Photo Credit Michael Hsu. Normally I wouldn&apos;t recommend a fast-food burger joint to visitors, especially in a city with such a wide variety of renowned restaurants, but P Terry&apos;s is no regular drive-through burger. This is comfort food at its best and there are options for everyone here (who doesn&apos;t like a good milkshake with their burger am I right?). This establishment does not sacrifice taste for cost and focuses on every component of every burger by choosing their freshest and tastiest ingredients. What I love about the P Terry&apos;s veggie burger is that it is made in-house and dressed up just like a classic burger with fresh veggies and the famous P Terry&apos;s special sauce. For an even healthier option, you can get the burger wrapped in lettuce instead of a bun, but don&apos;t skip the best part of the meal: the french fries! Be prepared for a bagful because they&apos;re made for sharing. I recommend hitting up the location at Barton Springs and S. Lamar then heading over to Butler Park for some of the best views of downtown Austin. Or, check out the N. Lamar location (near the University of Texas) for a quick dinner before going to watch the sunset over the Colorado River at Mount Bonnell (fair warning: you have to climb the stairs to get to the view). For those planning events around the city, be sure to check out the brand new P Terry&apos;s food truck that is available for catering. The new mobile option offers all of the classic burger choices in a fun and compact setting that is uniquely Austin!